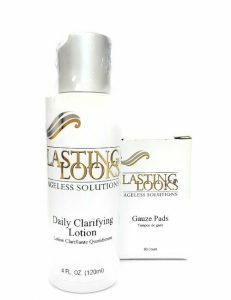 “Daily Clarifying Lotion” contains Lactic Acid, which is a gentle Exfoliator. Through its unique properties, it removes dead and damaged skin cells without irritation. It is well recognized that skin rejuvenates itself by a process of exfoliating the outer layers of old cells, and replacing them with new healing cells.As we age, the rate of exfoliation slows down and allows old dry skin cells to accumulate on the surface of the skin. These cells darken and result in wrinkles of the skin and a dull complexion.By removing the outer layers of dead skin cells, younger healthier cells are exposed revealing a striking improvement in the appearance and texture of the skin, thus new cell growth. It’s this stimulation that returns skin to its younger condition.